ALPHARETTA, Ga., March 11, 2014 – FITBIONIC Inc., Boulder, Colo., an upstart developer and manufacturer of next-generation prosthetic technology, has launched its first product – an innovative prosthetic foot that features high load-carrying bearings made of Torlon® polyamide-imide (PAI) from Solvay Specialty Polymers. The ultra-high performance thermoplastic delivers long-term strength and stiffness along with exceptional wear and fatigue resistance in this highly demanding load-bearing application. The FITBIONIC prosthetic foot, developed specifically for lower-activity and diabetic amputees who comprise more than 80% of the U.S. amputee population, utilizes Active Stability™ technology to help wearers feel more stable and potentially prevent injuries while walking. Effortless ground conformance and reduced pressures on the wearer’s tissues combine with propulsive energy to deliver the most human-like walking foot commercially available, according to Jerome Rifkin, chief technology officer and founder of FITBIONIC. The prosthetic foot assembly includes a lubricious, nickel-plated aluminum axle that rides on and between two bearings made of Torlon® PAI, thus providing multi-axial motion. The 0.75 x 0.50 x 0.5 in. (1.9 x 1.3 x 1.3 cm) bearings are machined from Torlon® PAI plate stock. FITBIONIC may potentially switch to injection molding Torlon® PAI bearings to handle larger production volumes since Torlon® PAI offers the flexibility to convert the application. “Patients put our Torlon® PAI components through demanding situations and varying loads for years of hard wear,” said Rifkin. Torlon® PAI provides the highest strength and stiffness of any thermoplastic up to 275°C (525°F). It has outstanding resistance to wear, creep, and chemicals and is ideally suited for severe service environments. Rifkin said Torlon® PAI exhibits exceptional bearing properties (fatigue resistance and compressive strength), resulting in long-lasting performance. It also yields a stable tribological interface by virtue of its strong mating and compatibility to a receptacle made of polyetheretherketone (PEEK). Torlon® PAI exhibits metal-like performance and is routinely specified for precision components used in repetitive-use, load-bearing operations. The material’s exceptional wear resistance withstands the forces of walking that are projected on the bearing’s 0.5-in. (1.3-cm) wide surface without any material loss or non-uniform wear. 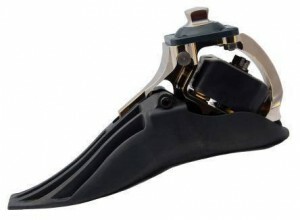 FITBIONIC offers the new prosthetic foot for body weights up to 250 lb (113 kg). The company currently sells the prosthetic device to prosthetists throughout the U.S.
FITBIONIC Inc. is a consumer-centered prosthetics company with a first-in-industry focus on cultivating healthy lifestyles for amputees. Founded in Boulder, Colo., the company combines designers, technologists, and entrepreneurs from leading bionics and prosthetics companies. Development of FITBIONIC’s feet was supported by a $1.2 million grant from the National Institutes of Health, and the foot has garnered multiple design awards and national recognition. For more information, visit www.fitbionic.com.